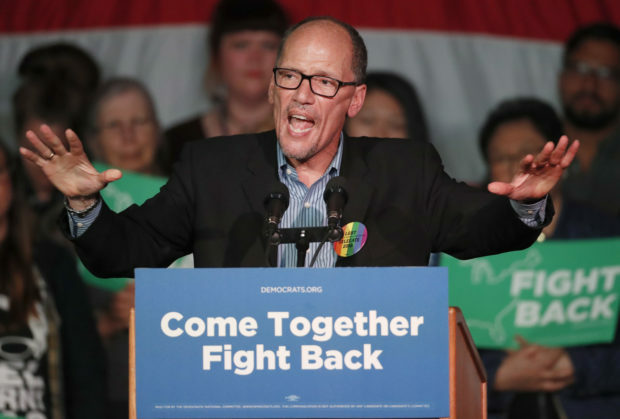 Democratic National Committee Chair Tom Perez gave a misleading answer on Friday when he was asked about the strong economy under the Trump administration. MSNBC anchor Ali Velshi praised the strong October job numbers in an interview with Perez but asked why voters may not have a high level of confidence in the economy. Perez first suggested that people are not satisfied with the economy because wages are not rising, which is inaccurate. According to data released by the Department of Labor Friday, wage growth broke 3 percent for the first time in nearly a decade during the month of October. The Washington Post fact-checked a similar claim about the unemployment rate made by Democratic California Sen. Kamala Harris. “The fact of that matter is that relatively few people hold two or more jobs. As of September, only 4.9 percent of employed people had multiple jobs, according to the Bureau of Labor Statistics,” WaPo explained. Perez added that he is “glad there are more jobs being created” but said Republicans are trying to deflect from the issue of health care.